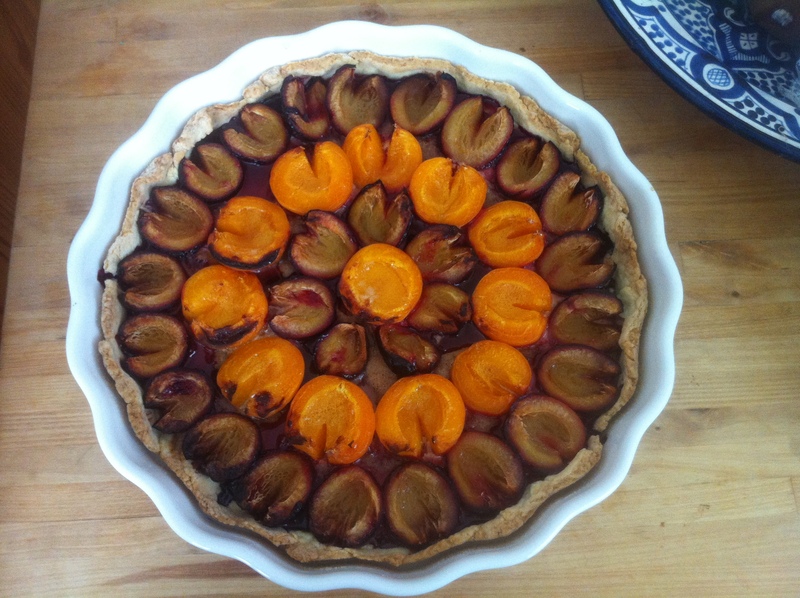 Plums and apricots are plenty right now and I think a tart is one of the nicest ways to make use of them. I usually make this tart with plums only, but today I did not have enough to cover the tart so I mixed in some apricots – to a really nice result. 1) Mix the flour, sugar and the butter (cut into cubes) until the mixture resembles breadcrumbs. Work in the egg and knead into a smooth dough. Wrap with cling film and refridgerate for half an hour. Note: I sometimes omit this step if I am short of time. It makes the pastry crumble at the edges when you roll it out, so you have to do a lot of “repair work” when you line the tart case with the dough but otherwise, it turns out fine. 2) Stone and cut the fruit in half. Make a cut into each half, about midway. 3) Roll out the pastry to fit a 30cm tart case and line the tart case with it. 4) Fit a piece of baking parchment into the pastry and use some dry chickpeas to weigh it down. Blind-bake the pastry for 20-25 min. Note: If I am short of time, I omit the blind-baking also and just bake the tart for 35min. The base will not be crisp though. 4) Mix the almond paste, sugar and egg and spread onto the pasrty. 5) Arrange the fruit, skin side down, onto the pastry. Sprinkle with sugar according to taste and ripeness of the fruit. 6) Bake for 25 min.